This fresh one-page two-column CV template has space for a photo and quotes from references or achievements in a fantastic font. It has a lovely split background with a splash of blue. and a clear easy-to-read font for the rest of your information. 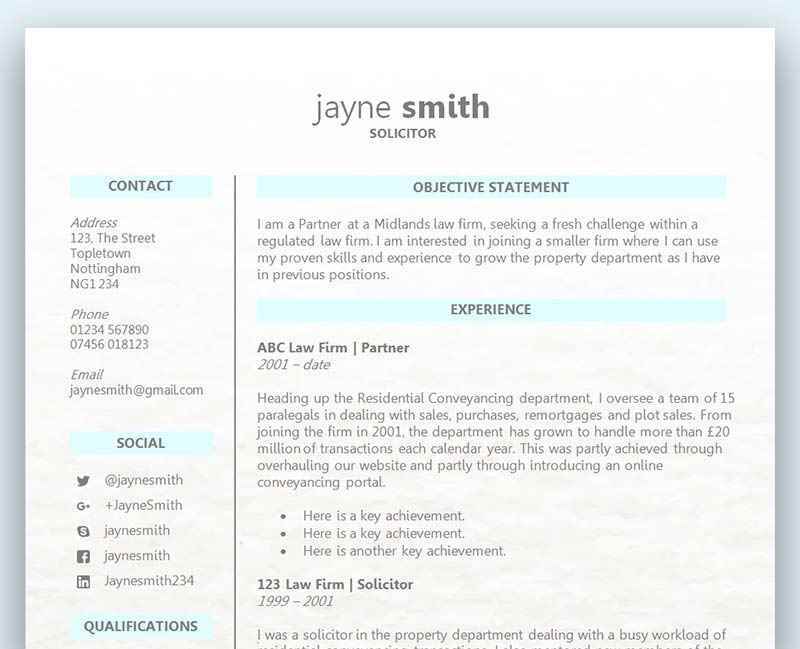 Free Paralegal CV template in Word	Overall rating:	5	out of 5 based on 8	reviews. It's always easier to download the fonts first before editing your template - otherwise you'll have to apply the styles to the different parts of the CV. The article linked below not only shows you how to create a circular photo, but it also includes lots of other tips and tricks for customising your template. The image in this CV template is used under licence and must not be reproduced, except in connection with the use of this CV template for your own personal use (plus, it would be very odd if you used somebody else’s photo on your CV)! To change the picture in the template (for example, to insert your own head shot) simply right click and choose ‘Change Picture’. CV advice: should I use colour on my CV? Will using colour on my CV increase or decrease my chances of getting an interview? What will the employer think if I use colour on my CV? Trying to figure out if an employer will be pleased to see colour on your CV is pretty impossible. Unless you contact the hiring manager and ask them their thoughts, you are just not going to know what the outcome will be. You can’t predict the future, but you can however be smart! Consider the role and the company you are applying to, and whether or not using colour on your CV would seem appropriate. If you were applying for a creative role – graphic design or video editing – then using colour on your CV could be expected, and without it, could put you at a disadvantage. Your creativity may need to shine through on your CV, and what better way than to create a CV that showcases your talents for presentation. Using colour on your CV could make the difference between getting an interview or a rejection email. In some cases however you may find that using colour could put you at a disadvantage and come across as unprofessional. Again, consider who you are applying to and make a cautious approach. How much colour should I use on my CV? If you are confident that the employer would love to see lots of colour on your CV, again, if it was for a creative role as above, then don’t hesitate – go for it! Use a few bold colours if you want, but be careful not to detract from your information. You want the hiring manager to take note of your CV, but not for the wrong reasons. Try to keep your CV template closely related to the role you’re applying for, so not only are you adding colour to your CV and showing off your creativity, you are also making your presentation relevant to the role/industry. If you want to be more subtle and only apply a little colour to your CV, then consider using grey or light blues and yellows. This is a much safer approach and a lot less likely to offend the employer and come across as unprofessional. In most cases a little colour will highlight certain sections of your CV and make it easier for the eye to navigate.